A New Map of Scotland. 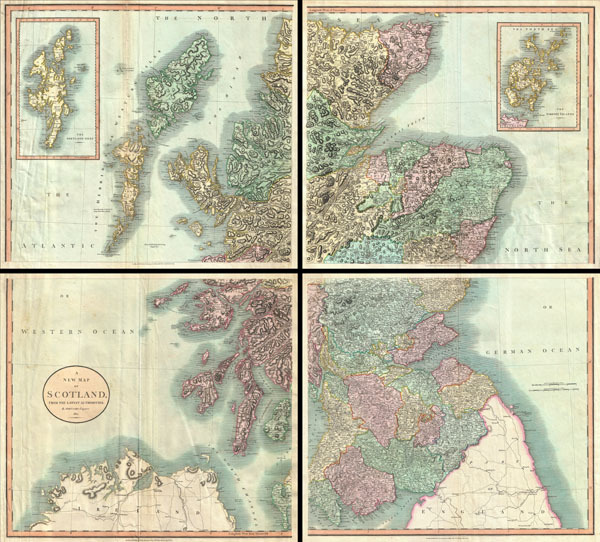 A very attractive example of John Cary's stupendous four sheet 1801 map of Scotland. Covers the entirety of Scotland as well as parts of neighboring England and Ireland. Inset maps detail the Orkney Islands and the Shetland Islands. Offers extraordinary detail on the whole of Scotland with special attention to topography, historical notations, and roadways. Note mileage. Four sheets designed to be united into a single massive wall map of Scotland see the Rumsey example, 1675.011. All in all, one of the largest and most highly detailed maps of Scotland to appear in first years of the 19th century. Prepared in 1799 by John Cary for issue in his magnificent 1808New Universal Atlas. Good condition. Printed on four separate sheets. Some sheets exhibit minor wrinkling and certerfold discoloration. Designed to be assembed into a single gigantic wall map of Scotland. Unjoined but priced to accomidate this as well as minor restoration and conservation work. Rumsey 1657.011 (joined example). Phillips (Atlases) 714. The Map Collector, issue 43, p. 40-47 (Atlas). National Maritime Museum, v. 3, no. 311.